This antibody does not detect human inducible NOS or rat brain nNOS. ab5589 has been successfully used in Western blot and immunohistochemistry (paraffin and frozen) procedures. 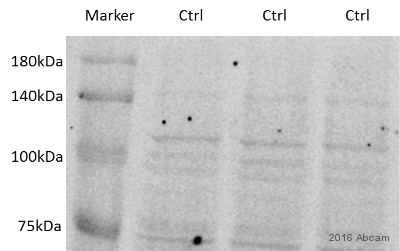 By Western blot, this antibody detects an ~140 kDa protein representing eNOS from human endothelial cells. Immunohistochemical staining of eNOS in Human vascular endothelial cells with ab5589 results in prominent staining of the epithelial cells. Synthetic peptide corresponding to Human eNOS aa 1179-1194. IHC: Human endothelial cells. WB:canine cardiac microsomes and rat or human lung lysate. We have received mixed feedback from customers regarding rat specificity; this is why we are temporarily removing Rat from tested species list and no longer guarantee it. Our laboratory is currently testing new lots so please contact our scientific support team (technical@abcam.com) for more information. Our Abpromise guarantee covers the use of ab5589 in the following tested applications. WB 1/1000. Predicted molecular weight: 133 kDa. By Western blot ab5589 also detects eNOS in canine cardiac microsomes. 5% BSA in TBST is recommended as blocking buffer. Isoform eNOS13C: Lacks eNOS activity, dominant-negative form that may down-regulate eNOS activity by forming heterodimers with isoform 1. Variation in NOS3 seem to be associated with susceptibility to coronary spasm. Phosphorylation by AMPK at Ser-1177 in the presence of Ca(2+)-calmodulin (CaM) activates activity. In absence of Ca(2+)-calmodulin, AMPK also phosphorylates Thr-495, resulting in inhibition of activity (By similarity). Phosphorylation of Ser-114 by CDK5 reduces activity. Cell membrane. Membrane, caveola. Cytoplasm, cytoskeleton. Golgi apparatus. Specifically associates with actin cytoskeleton in the G2 phase of the cell cycle and which is favored by interaction with NOSIP and results in a reduced enzymatic activity. IHC image of eNOS staining in human placenta formalin fixed paraffin embedded tissue section*, performed on a Leica Bond™ system using the standard protocol F. The section was pre-treated using heat mediated antigen retrieval with sodium citrate buffer (pH6, epitope retrieval solution 1) for 20 mins. The section was then incubated with ab5589, 1/100, for 15 mins at room temperature and detected using an HRP conjugated compact polymer system. DAB was used as the chromogen. The section was then counterstained with haematoxylin and mounted with DPX. Immunolocalization of eNOS in human lung tissue using ab5589. Publishing research using ab5589? Please let us know so that we can cite the reference in this datasheet. We want to perform western blotting on HUVECs (Human Umbilical Endothelial Vein Cells) and A7R5 cells lines (rat aortic smooth muscle cell), both of the cell lines contain eNOS. As we found various sources of anti-eNOS antibody for WB on Abcam webpage, such as ab66127, ab5589 and ab51086, we are wondering which one could be suitable for our needs? Out of these antibodies, I would suggest using ab5589 as we have had one customer who used this in western blot and obtained good results. In addition, this antibody has also been extensively used in WB in several publications. Band around 25-30 kDa in Western blot instead of around 130-140 kDa as expected. As we discussed, I'm sending a free of charge vial of ab66217 which should arrive tomorrow. Please keep me updated about the results after trying this antibody, and let me know if there is anything else that we can do for you. I'll be happy to help. Looking for antibodies to use in ICC with human cells. Thank you so much for your calls today and for your questions. Please let me know if you would like to try any of the antibodies in ICC that haven't already been tested, and I will be happy to set up the testing discount program for you. If you have any questions or need anything else, please don't hesitate to ask. phone call: searching antibody for eNOS and phospho eNOS on rat and mouse tissue, on IHC-P and WB. A while ago we spoke in regards to searching for the best antibodies to use for detection of eNOS and phospho eNOS on mouse and rat tissue, on paraffin sections (IHC-P)as well as in Western blot. We have the ab66127 or the ab5589 against total eNOS which have been tested in mouse and rat, as well as in IHC-P and Western blot. These antibodies are therefore guaranteed by us for this use. https://www.abcam.com/index.html?datasheet=66127 (or use the following: https://www.abcam.com/index.html?datasheet=66127). https://www.abcam.com/index.html?datasheet=5589 (or use the following: https://www.abcam.com/index.html?datasheet=5589). As an antibody against phsopho eNOS, we do have the ab75639 which recognizes the S1177 on eNOS. This antibody is again tested and guaranteed in mouse, rat and IHC-P and Western blot. https://www.abcam.com/index.html?datasheet=75639 (or use the following: https://www.abcam.com/index.html?datasheet=75639). I have followed up with the laboratory in regards to the protocols used for the ab75639. For the Western blot, the cell lysates have been prepared with protease and phosphatase inhibitors. Before loading, the lysates have been denatured and reduced. Importantly, the membranes were blocked with 5% BSA in TBS-T. The IHC-P has been performed with heat induced antigen retrieval in Citrate buffer pH 6. I hope this information is still useful. Please do not hesitate to let me know if you have any question or if you require any other information from our side in regards to these or other antibodies.